Another fantastic book by Bryce Courtenay. Six year old Tom Fitzsaxby finds a dog barely alive and saves it. Tom lives at the Boy's Farm, an orphanage in Northern South Africa. This part of SA is very Boer and vehemently anti-English. Tom befriends the 'pig boy' who is a Zulu. The dog if found will be drowned. Tom is almost sexually abused to keep his dog a secret. The Zulu is the person who saves him but he later pays with his life. The story is about Tom's life as an outsider and a non-racist. First the school is rife with abuse and Tom is the focal point for the hatred for the English. Courtenay portrays South Africa from WW II to about the 1960s. The story is riveting but the history is equally interesting. Tom is an intelligent compassionate young man who only wants justice. As a doctor on the South Pole, Nielson explains what you experience when you "winter over" at the pole. Polies that winter over are essentially stuck at the South Pole for a year - without anyone going in or out of the station, including supplies, during a South Pole winter (approximately February to September). During the 1999 stay over the Nielson does, there are 41 other Polies wintering over. Nielson first paints a picture of her life before she discusses anything about the Pole so that the reader can understand where she comes from. Her past is marked with a horrible marriage, including a real jerk of an ex-husband, and three teenage children that will not talk to her. Something about her story doesn't sit right with me. I'm not sure if it's because I've been lucky enough never to have known anyone in that type of relationship. I think the main problem was that once the children found out their mother had cancer, they did not contact her and did not even want to talk to her. Nielson then talks about what life is like at the bottom of the world. The way these people come together as a community is amazing. About half way through her stay, Nielson finds a lump in her breast. She then has to deal with the struggle as the only doctor on the base, being sick, and wondering if she has cancer or not. This book is about survival: mental and physical. It's a truly amazing story, both from surviving disease and the harsh conditions of the pole. I stayed up quite late a few nights ago finishing it! I recommend this book! Christopher Boone is autistic. He is a math genius but hates the colours yellow and brown. His neighbour's dog is killed and Christopher decides to investigate. This book is not a straight path to the killer but rather a delightful quirky meandering path. Along the way we learn some math problems and about Christopher's school. We find out about his parents' quarrels and his daily life. The forth book of the Unfortunate Events series sees Violet, Klaus, and Sunny abandoned in front of a lumber mill, with used gum as the sign. They were told that they would be taken care of in the mill, but they didn't expect to be put to work! The children were expected to work like all the employees, get paid in coupons, and have only gum for lunch. While the orphans don't enjoy this, they think it's better than having Count Olaf vying for them. But are they really safe? 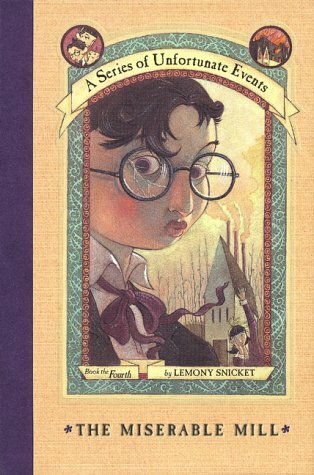 I enjoyed this book the most in the series. The childen were required to think outside the box to help their situation. Though really, all these books are very much the same, it's a little hard to differentiate between them all. Stephen Wraysford starts off a young man in France, of British heritage, trying to learn more on the French textile industry in the early 1900s to bring back to his company in England. He falls in love with his boarder's wife and runs away with her. The novel then moves a few years into the future to World War One. Stephen is part of the British Army, on the front line in France, trying to stay alive. He becomes good friends with Michael Weir, an engineer that commands tunnelers to dig below the trenches and set bombs. The novel skips back and forth in time, even going as far as the late 70's, to Stephen's granddaughter. The writing of this novel is incredible. The descriptions make you feel like you are there. The depiction of war is horrendous, and I was even starting to feel claustrophobic when Faulks talked about the tunnels that the miners created. The novel makes you realize how little we know about war and how little one could ever know about war if they do not experience it for themselves. That being said, Faulks makes it very clear that no one should ever have to experience. The men on the front lines see death every day and while they don't grow accustom to it, they no longer question it. Soon they begin to grasp for any sort of normalcy and pray that they can return to a real life. For those that were on the line longer, they know there is no turning back. They will never be the same, and they will never be able to discuss their experience with their loved ones. I was a little put off by the switching in time. There was a lovely love and loss story building up in the first 150 pages or so, then there was a complete 180 to the horrors of war. Once I started to get used to that, Faulks then switched to the late 70s and Stephen's grand daughter. Overall, I found this book to move a bit too slowly for my tastes. But I'm happy that I did get through it because it does have an overall message about war that I think everyone should read. This is a bizarre book. The current Lord Loveall rescues a baby from a hound on his way home one night. He then decides to present this baby as his only heir. He marries his dead sister's governess and brings up Rose as his own. Rose is brought up with 2 servant children as her only friends. Then her world comes crashing down when it is discovered that she is a he. He is thrown out as an imposter and is banished from Love Hall. The story as far as this synopsis goes is intriguing and interesting. Full Stop!!. I had a diffcult time getting through this book. There are times when it just does not make any sense at all. The story line gets more and more bizarre and completely unbelieveable. The characters do things that just don't make sense, starting with throwing out Rose for no discernable reason. Like my mom, I will also be participating in Annie's What's in a Name challenge. The goal is to read a book from each category between January 1, 2008 and December 31, 2008. I think the hardest part of the challenge for me is going to be finding the books so that I can read them!! I know where some of these books are... haven't seen the last for a while. I do have a year to find them though!! A very interesting historical fiction! This book covers three generations of Burmese-Indian people. I found it quite disturbing how the English treated their colonials. Their justification of this treatment sounds too familiar even today. The question about responsibility for the conquered is also explored. Jane Bee did a whirlwind trip of Europe until she found herself in London, England broke with no way to return back home to Canada. Her great aunt helped her find a position at Buckingham Palace where Jane works as a housemaid. When Jane rushes to find out the source of a loud gasp, Jane finds the Queen literally stumbling over the dead body of Jane's friend Robin. The Queen enlists the help of Jane to find out if this was suicide or if it was murder. It was nice to read a book where the main character is a Canadian. It's not often characters are Canadian and talk about their heritage. I'm not big on cozy mysteries, so that could be why I found this book didn't do a great job of grabbing my attention. I found it kind of slow, but I did manage to get through the whole thing so it wasn't necessarily dull. That being said, I won't be reading anymore in the series.